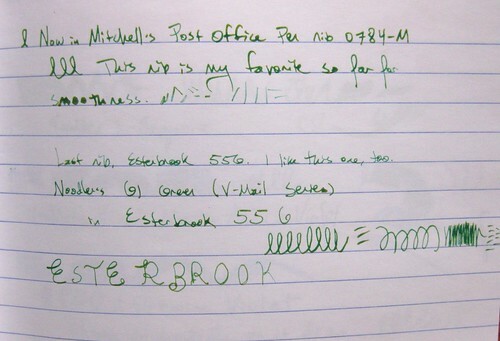 This Noodler's V-Mail series GI Green ink generated a lot of hubub because of the "orange halo" that appears around thicker lines of the ink. It is clearly visible in these photos, especially on the wetter dip nibs used. However, Noodler's has since reformulated this ink to make it darker. The samples shown here are definitely the original version. You can view this large if you have a Flickr account of your own. More views of the sane ink, from different dip nibs. 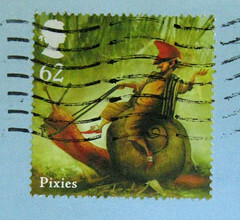 You can also take a closer look at this one, with said Flickr account. I do have this ink loaded in a pen now, but the pen (a Platinum Riviere - thanks, Carroll!) 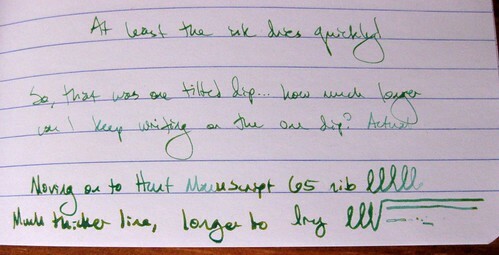 is rather on the dry-writing side, and I've never been able to get the orange tones from the ink in that pen.